Edfu is located on the west bank of the Nile, between Esna and Aswan, about 115 km far from Luxor or Aswan. Edfu is the site of the Ptolemaic Temple of Horus and an ancient settlement, Tell Edfu. It is easily to visit in one day from Luxor or Aswan and is a popular stop for river cruises. The Temple of Horus, was built from sandstone blocks between 237 BCE and 57 BCE on top of an earlier temple of Horus, which was oriented east-west instead of the current north-south configuration. It is the best preserved cult temple in Egypt. Its size reflects the relative prosperity of the time. The temple is dedicated to the falcon headed god Horus, who was originally the sky god, whose eyes were the sun and the moon. Later Horus was assimilated into the popular myth of Isis and Osiris, as the child of this divine couple. After Osiris was murdered by his brother Seth, Horus was raised by Isis and Hathor. Horus avenged his father’s dead in the great battle at Edfu. Seth was exiled and Horus took the throne, Osiris reigning through him from the underworld. The Temple of Horus is the largest temple dedicated to Horus and Hathor of Dendera. It was once the centre of several festivals sacred to Horus. Hathor travelled south from her temple at Dendera each year, to visit Horus at Edfu and this event marking their sacred marriage was the occasion of a great festival and pilgrimage. On both sides of the entrance of the temple we find statues of the falcon headed god Horus. The oldest part of the temple is the section from the Festival Hall to the Sanctuary. This part was begun by Ptolemy 3 in 237 BCE and completed by his son, Ptolemy 4 Philopator. The Hypostyle Hall was added by Ptolemy 7 between 145-116 BCE. The pylon was erected by Ptolemy 9 between 88-81 BCE. The final touches to the temple were added under Ptolemy 12 in 57 BCE. One of the most remarkable elements of the temple is the existence of a Nilometer, as well as a chapel, which was dedicated to the goddess Nut. The inscriptions on the temple walls provide important information on language, myth and religion during the Greco-Roman period in ancient Egypt. There are many battle scenes on various walls of the temple, as well as the famous scene of the ritual of the temple foundation. On the inside of the outer corridor of the western side of the temple we’ll find the legend of the conflict between Horus and Seth, the victory of Horus over his uncle, and his coronation to rule the world. Over the centuries the Temple of Horus became buried to a dept of 12 m beneath drifting sand and layers of river silt deposited by the Nile. Local inhabitants built homes directly over the former temple grounds. Only the upper reaches of the temple pylons were visible by 1798. It was then that the temple was identified by a French expedition. In 1860 Auguste Mariette, a French Egyptologist, began the work of freeing Edfu temple from the sands. The sands that protected the monument over the years, leaving it very well preserved today. The remains of the ancient settlement of Edfu are situated about 50 m to the west of the Ptolemaic temple – to the left of the older temple pylon. This settlement is known as Wetjeset-ho. 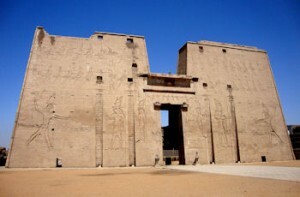 Tell Edfu is a monument that is of more archaeological interest than the Ptolemaic temple. It contains evidence of more Egyptian history. Although major parts of the settlement show severe signs of erosion, have been cut away or even exposed during sebakh-digging, enough is preserved to gain information from as far back as the Pre-dynastic Period. The remains of the settlement (tell) provides an insight into the development of Edfu as a provincial town from the end of the Old Kingdom until the Byzantine period. The settlement at Edfu was the capital of the Second Upper Egypt Nome. It played an important role within the region. The oldest part of the town which can be dated to the late Old Kingdom lies on the eastern part of the tell, not far from the Ptolemaic temple. There is evidence that the town flourished during the First Intermediate Period when it expanded extensively to the west. Interestingly, it is one of few settlements in southern Egypt that thrived when it seems that the north, especially around the delta, was in economic decline. Today, the ancient mound of Tell Edfu is preserved in some areas up to 20 m high and contains complete archaeological sequences of occupation dating to the Old Kingdom until the Greco-Roman period. This is more than 3000 years of history, therefore providing ideal conditions to study the development of a provincial town.